There are few paintings in Chagall's earlier oeuvre that display the sheer verve and utter sense of joyous abandon that he brought to his late floral still-lifes. His obvious pleasure in these subjects borders on the magical and ecstatic, and he expresses an inexhaustibly youthful vigor and ardor in the very act of painting them. Chagall's bouquets are pyrotechnic displays in paint, exploding upward and outward, as if flowers were earthly matter transformed into pure energy, emitting their own light, and radiating a beneficent life force all around. Flowers were an integral part of this master's life-affirming vision of the world, in which these colorful splendors of nature actually seem larger, more brilliant and even more vital than in real life. Such paintings happily soar far beyond the confines laid down in the literal translation of the traditional French genre of the nature morte. Each Chagall painting of this kind projects the newness, the effervescent freshness and pure excitement of spontaneous discovery. And so this arrival of spring, in Chagall's imagination, has been experienced as if for the first time, for the wondrously stunning miracle in the unceasing cycle of seasons that it is. And to top it off, what could be more memorably delightful than a warm and sunny vernal day, enjoyed al fresco, in Paris? Chagall first painted an extended series of floral still-lifes during his travels around central and southern France, in the Midi, the Auvergne and Savoy, during the late 1920s. It was in this way, by studying and painting the resident flora of the local countryside, that the artist most intimately acquainted himself with the beauties and charm of la belle France. He discovered, as had Fantin, Redon and Renoir before him, that flowers are the living organisms in which color manifests its properties with the most appealing purity, subtlety and brilliance, inspiring the most delicate impressions and harmonies of which painting is capable. "The flower pieces of that period," Franz Meyer wrote, "as Chagall said later, were des exercices dans la couleur-lumière... 'exercises in the equation of color and light'" (Marc Chagall: Life and Work, New York, 1964, p. 369). 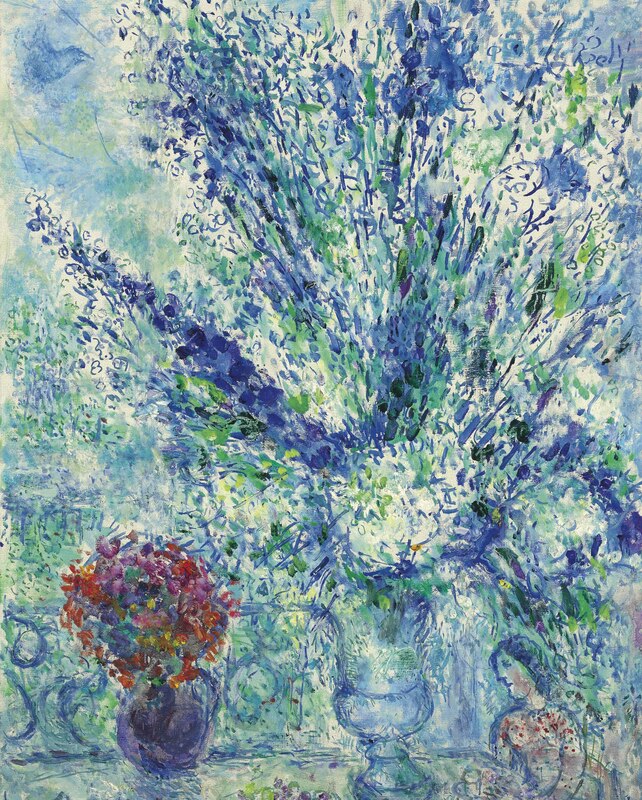 Following tours of Greece in 1952 and 1954, Chagall was again drawn to flowers. These journeys rewarded him with a more direct and sensitive feeling for the light of the Mediterranean, and an understanding of humankind's symbiotic place in its natural environment. In the works of the late fifties, nearing the end of Chagall's career as covered in Meyer's monograph, the latter claimed that "Never has his world been so bright, so radiant with joy" (ibid., p. 552). There was much more to come--Chagall continued to paint for another quarter of a century. Chagall painted Printemps à Paris only weeks before he travelled to Russia in June 1973 for a much-heralded visit, his first to his native land since his departure in 1922, during the difficult years following the Russian Revolution. The poet Andrei Voznesensky was much moved to see the artist keeping pressed cornflowers, that most humble and commonplace of Russian wild blossoms, in his Moscow hotel room. He dedicated a poem to the artist: "So this is what you truly love: since Vitebsk, cornflowers have wounded and loved you. An orphaned flower...its blue has no rival. How did a cornflower seed chance to fall on the Champs-Elysées, on those fields?" (quoted in J. Baal-Teshuva, ed., Chagall: A Retrospective, New York, 1995, p. 341). "Marc Chagall loved flowers," wrote André Verdet. "He delighted in their aroma, in contemplating their colors... Usually they created a sense of joy, but they also reflect the melancholy of memories, the sadness of separations, of solitude, if not suffering and tragedy... I remember a visit to La Colline [Chagall's home in Vence] some time ago. He had taken a painting from his studio and placed it against a tree trunk next to plants and flowers. He said, 'If my painting holds up in nature, if it doesn't disturb the harmony, then it is real, and perhaps one day I could put my name to it'" (quoted in ibid., p. 347).